K is for Kitchen Maid. Kate is the Kitchen Maid at Cadblister Hall. She is not really named Kate. Nor is her name Catherine. Kate’s birth name is Beatrix Howlett. She was born in Whitechapel, and became an orphan at eleven. After years of being a maid-of-all-work, she looked around for a better job, preferably in a house with a large library, for she loved reading above all things. When she heard that there were several openings at a place called Cadblister Hall, it sounded just about perfect. In the initial interview, Lady Cadblister had studied Beatrix in silence for a time, looking discontented, not with her so much as with the whole world, of which she was the latest manifestation. “You have freckles,” she said at last. “Not Jane, I think,” she said thoughtfully. And within the week, she was living in a tiny room in a warren of tiny rooms, deep within the bowels of Cadblister Hall. Within the month, she felt herself becoming Kate. That is, the name began to be hers, and she its. Kate was demure; Kate was obedient. Kate never expressed an opinion in the presence of a superior. Kate’s eyes were ever cast down, to spare the gentry the discomfort of accidental eye contact with a menial. Kate would never sneak into her employers’ library and read their books in secret. But Beatrix would. And Beatrix does. For the two personalities are not in conflict: they are parts of a whole, like the inside of a thing and the outside, or the spirit and the body, or the brightness and the flame. Kate stood in a huddle of other servants at the top of the lane, watching the police Investigate. “Either it’s Investigation,” said Susan, Lady Cadblister’s personal maid, “or her Ladyship has hired them to dig out the path.” For, at the moment, the police were digging, slowly and with great care, through two or three feet of snow in the place where Lord Cadblister’s body had been found. The lane was roped off at top and bottom. Behind the top rope stood, as has been said, most of the servants at the Hall. Behind the rope at the bottom of the lane were assembled many villagers. Free entertainment is not to be sneezed at in a remote spot like Cadblister Parva, and this was perhaps the best-attended event of the year. The scene struck Kate as symbolic. Here were the people of the Hall; there, across a great divide containing policemen, were the people of the village. This thought pleased her sufficiently to take her mind briefly off her troubles. Or, rather, her trouble. His name was the Hon. Percy Neville Bloater, and he was Lady Cadblister’s nephew. He was also one of those young men who viewed pretty kitchen maids as his personal property, to do with as he list. He had arrived a fortnight back, and, on his first day, he’d managed to encounter her five separate times. Encounters between servants and gentry were generally things that both gentry and servants did much to avoid. Kate was therefore alarmed at how much she seemed to be seeing of the Hon. Percy Neville Bloater. On the second day, he’d made eye contact with her. She’d seen him four times that day. On the third day, she saw him six times, and he’d smiled at her on each occasion. On the fourth day, he’d winked, and he seemed to be everywhere. And then on the fifth day, he’d caught her in the library. She managed, every day, to finish some task early, and then she’d slide off to read. She was sure that Lord and Lady Cadblister would give her her notice at once if they found out she’d been reading their books, though she did not understand why this should be so. She was also quite sure that they’d decide she was a thief and have her thrown into prison if they found their books in her tiny room. Kate therefore did her reading in a hiding-place in the library, where the worst she could be accused of was reading books that weren’t hers. But there was a snag. Her vocabulary was fairly extensive, and she was good at figuring words out. Sometimes, though, she’d hit on a stumper, and then there was nothing for it but to break from cover and go look the word up in the gigantic dictionary that reposed majestically upon its own lectern. Kate had been at the dictionary, trying to locate the definition of ‘eleutherarch’ (for she was currently reading Thomas Love Peacock’s Nightmare Abbey), when the Hon. Percy oiled in. “Reading our books? Tut, tut!” He spoke with taunting disapproval. “I’m not doing them any harm, sir,” she said, outwardly calm. “Ah, but they may be irrevocably harming you,” he said. “You are getting ideas beyond your station. Auntie would disapprove. In fact, you’d be out in the snow, and you no doubt know that.” He moved closer. “Give me a kiss or I will tell her,” he said. In the event, she didn’t have to give him a kiss, because he didn’t wait. He kissed her. It was the worst moment of her life, and her life had not been easy. And what if he went on from the kiss to take further liberties? But he’d merely pushed her away from him after a minute, laughed, and left the room. Of course, that hadn’t been the end of it. He’d been at her every day since, and she frankly didn’t know what to do. She did not want to lose her job, which meant that she couldn’t use fists, or well-placed kicks, or even a good, loud scream, to keep him off. He would, it was clear, punish her for any such reaction. And her verbal protestations fell on deaf ears; he pretended to think (she was sure it was a pretense) that she was merely being coy. She’d just decided to Tell All to Lady Cadblister and Damn The Consequences- when Lord Cadblister died. Thereafter, Lady Cadblister retreated behind the impenetrable fortress of deep mourning. Before, it would have been very hard to tell her about her nephew, for Lady Cadblister was not a sympathetic or kindly woman. Now, it seemed utterly impossible. What on earth was she to do? The Hon. Percy had not assaulted her since the death, but he showed no signs of departing from the Hall, and he still looked at her with lustful speculation whenever they chanced to meet. The red-faced policeman- one of the Cadblister Magna lot- paused over his latest shovel-load of snow. Now, he was stooped, and digging with his gloved fingers. A hush fell upon the crowd. 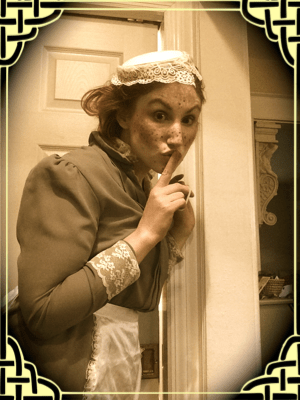 “What is it, then, love?” Called Fannie, one of the scullery maids. Mrs. Doombane, the housekeeper, turned her majestic head towards the girl, scowling horribly. “Putting herself forward again,” muttered Mrs. Doombane, ominously. Mrs. Withers, the cook, nodded her head in agreement with this pronouncement. James, the second footman, who was walking out with Fannie, so it was said, changed the subject hastily. He pointed dramatically to the policeman. The murmur went through the crowd. “A spoon! A spoon!” “Is it a spoon?” “A spoon- in the snow!” “Spoons has no business in snow, they don’t.” Everyone in the little group was making remarks. Or, no. Not quite everyone. Kate observed that there was a sort of pool of silence around young Alfie, the Boots. He alone was not exclaiming about how odd it was that spoons should be found in snow. He had, in fact, gone deadly pale. And now the Inspector was hurrying over to join the red-faced policeman. Now he was examining the spoon, handling it carefully in gloved hands. “Fingerprints. He’s going to look for fingerprints,” Kate said to no one in particular. This caused another clamor of excited remarks. “- so this man, he takes up his knife and skins his own fingers, he does. Aye, and burns them, too, to seal them up, like.” This gruesome note immediately caught the interest of the crowd. Everyone fell silent and turned to the speaker- and turned away again, despairing. For the speaker had been Grip, the head gardener, and he was not a man as would repeat himself for anyone. This was known. Now the Inspector was coming up the lane. He was little, for a policeman, and moved across the crust of snow with the lightness and hopping dexterity of a bird. When he reached the huddled group of servants, he eyed them all in silence for a moment, waggling the spoon between his index and middle fingers. In his eye was a look of fierce geniality. There was a pitiful shriek from somewhere near the back of the crowd, and then the noise of scuffling. John, the splendidly handsome first footman, presently made his way to the Inspector, dragging young Alfie by the collar. “Here he is, sir,” said John, and stood back, duty done, and looking quietly satisfied. The Inspector looked Alfie over. As for Alfie, he didn’t seem to be looking at anything. Kate fancied that a gallows hovered in Alfie’s inner vision, blocking out external things. “Did you wear gloves when you stole it? If you didn’t, we’ll get you, you know.” He eyed the servants. “Fingerprints,” he intoned, dramatically. There was a communal sigh. Grip the gardener ambled over to Alfie and offered him a wicked-looking knife he’d produced from somewhere on his person. “Skin ‘un,” said Grip. “Burn after for safety.” But Alfie just stared down at the blade, fascination and horror written in every line of his face. Grip chuckled; the knife disappeared. The Inspector shook his head. “That old trick,” said this glorious personage with disgust. “We’re onto it at the Yard. Well, lad. Are you going to tell me all about it?” Alfie shook his head. “Well, I won’t lock you up- yet. But this spoon is going to our Fingerprint Bureau tomorrow, unless you tell me how this spoon- silver, and bearing the Cadblister crest- came to be in the lane. You know best whether the fingerprints that we’ll find on this spoon are yours or not. And once I send this in to the Bureau, the thing is out of my hands. May I also gently point out to you that I do not care about petty pilfering? I am here to solve a murder, you know. Don’t be more of a fool than you can help.” And the Inspector hurried away, for, as he was talking, there had come a shout from one of the Constables. Alfie groaned and started wordlessly wandering towards the house. Then he swerved, and headed instead for the main drive of the Hall. “Alfie, don’t go fleein’ the country, now,” called John. “Local boy,” muttered James. John shrugged and turned his attention back to the police. And Kate and the other servants walked back to the Hall. Kate walked quietly, thinking of many things. Hope the nephew gets his come-up-ins and young Alfie has no further trouble. Kristin- Me too! Poor Alfie- I’m not sure his nerves can take much more! And as for the Hon. Percy Neville Bloater- well, I will be hurling a couple of thunderbolts at him later on, never fear! I love this new character! Is it just my impression, or the story is taking a new turn? Hey Jazzfeathers- I love Kate, too! That is one reason I was late with this- I wanted to do her justice. I couldn’t bear to stop writing until I got her down on the page- you know? She kept me up writing until 6 A.M.- and I loved every minute of it. Actually, I cut a bunch of her back story, in the end. I may post it later- though it is awfully sordid… it was all about her childhood in Whitechapel and her relationship with her mother (a prostitute) and her experiences in the orphanage. What do you mean about the new turn? This section is rather more solemn than most, I think – but I didn’t want to deal lightly with sexual assault and the imbalance of power and all. Is that what you mean? Or do you sense a change of direction in the plot? Thanks, Jazzfeathers, for sticking with me!!!! I always smile when I see you’ve left a comment. I will read Kate’s story with pleasure, if you’ll ever post it. Yes, what I mean is that I feel a change of direction in the story. The last few installments felt kind of aimless, which make sense, especially if it’s true that Randall and Verity have nothing to do with the murder. But as this section started, I felt like, suddenly, there was focus again. This chapter was totally worth the wait. I can feel the energy and love that went into the words for Kate, who is awesome. I love her preamble, and the idea of the names separating the personalities (I see a common theme in your writing! 😉 ) Great, all around. Alex- yay! 🙂 And I had not noticed that common theme… but yeah, you’re totally right! Cool!